During the Fall of 2016, I was approached by my supervisor and Director of the University of West Florida School of Art, Barbara Larson about how we, the School of Art, could get more public art onto the UWF campus and become more visible as a department. After a few meetings and discussions with colleagues, we decided to create a Special Topics Ceramics Course for advanced students that would culminate in the creation of a student designed and made mosaic bench. In an effort to combine learning with the continued development and beautification of the UWF campus, my Spring 2017 / ART-3769: Sculptural Ceramics class used the students’ collective research of ceramic materials and glaze formulation to create a permanent mosaic bench. Funded by UWF Office of Advancement, the bench was ultimately located on the West / NorthWest side of the Science & Engineering Building /Bldg. #4, as seen in the pictures below. As a high-impact class, this curriculum gave students the experience of seeing first-hand the connections of ceramics and the arts with the fields of science, chemistry, math, engineering and design. 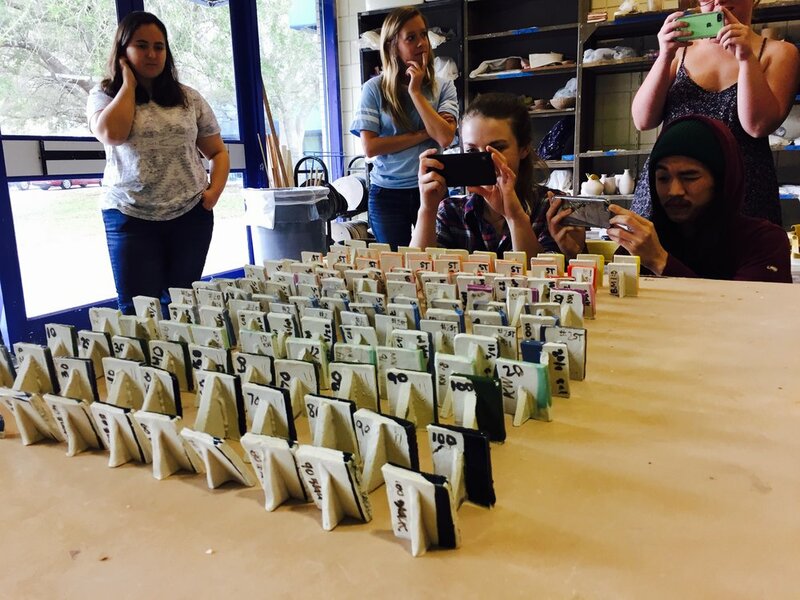 Unlike traditional ceramic classes where students work on their own individual projects, this class provided an opportunity for the students to take ownership and pride in a group project that contributed to the betterment of their community in the form of public art. From the get-go, it was made clear with the students and the school that the purpose of this class was to provide students an in-depth and comprehensive understanding of kiln firing, ceramic materials, glaze chemistry and the history of mosaics .... the making of a mosaic bench should be merely a result of their learning. Consequently, we spent the first half of the semester learning how to mix, test and apply the materials we had available in our classroom to make clay and glazes that were appropriate for mosaics and out-door sculpture. 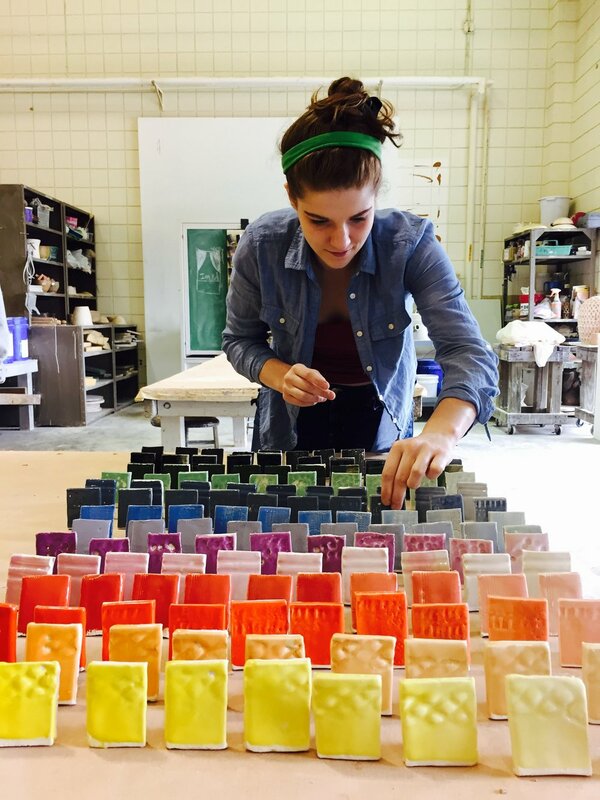 Below are images of students working with their glaze test-tiles. Above: The bench design selected by committee. Design by Madisen Pooton. By mid-terms, we had developed an outdoor clay-body for the bench and created a range of glaze colors and surfaces that we were able to adjust. The students were also introduced to examples of historical and contemporary mosaics and asked to create their own designs based on the themes we decided on as a group. Each student was ultimately able to submit a final design to be selected by a committee composed of the department heads of English, Science and Engineering, and the School of Art. 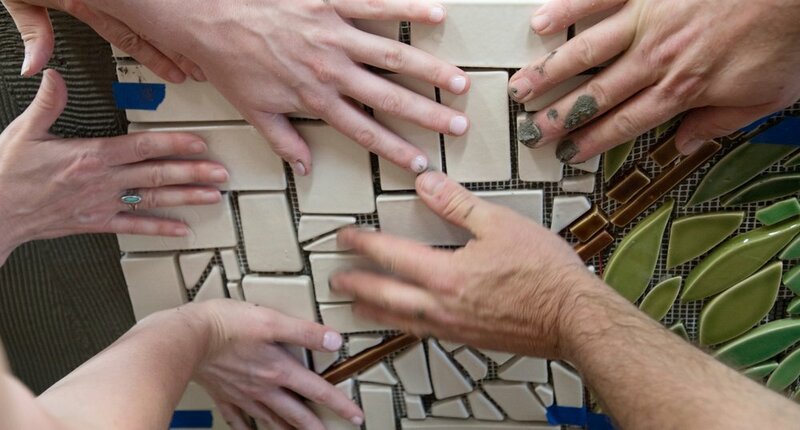 Once the design was selected, we spent the second half of the semester applying our research to the making of the tiles and finishing the mosaic bench. After the bench design had been confirmed, the students spent the next class choosing 8 glazes from our previous tests that we would ultimately use for the project. The concrete bench that had been delivered just a couple weeks prior, was then carefully covered with butcher-paper to create a template of the bench form. We used this template to draw the bench design and lay on a table in the studio to place the mosaic tiles. Next, we covered the template and drawing with clear plastic and then a mesh fabric. We then used a silicone caulk to attach each tile to the design that had been transferred onto the mesh. It was important to have the barrier of clear plastic so that we could easily separate the tile sections from the table and move them to our outdoor kiln area where the bench was located. Because of the clear benefits that such a high-impact class provides for both the students and to the UWF campus, our plan as an art department was to make this same class a part of the annual Spring ART 3769 curriculum. While I am no longer at UWF to teach this class, I do hope that this class has become a part of the SOA curriculum and is a project that the university has been able to continue to support. I am grateful for the opportunity to create and teach this class and hope that I can bring this experience and what I have learned with me to another program, university or workshop. Many thanks to my UWF students, colleagues and community. My intention for these posts is to share images, ideas and experiences that don't otherwise fit into the "galleries" of a website. WINGSPAN Magazine (ANA Airlines) / September 2018 / "Return to the Porcelain Capital"